If a nearby tree looks diseased / broken or overgrown, it could cause concerns about potential damage to your property if it falls. If you have concerns, what can you do? Always try to speak to your neighbour about any problems. If this isn't possible try sending an informal note. If that doesn't resolve the issue, then a more formal letter may be required. Just a quick note regarding the tree at [location]. [I/we] have concerns that the tree is [diseased / has a broken branch / is overgrown] and may damage my property if it falls.If the tree belongs to you, please could you have a look at this and arrange any required pruning etc to make it safe? If not, [I/we] will do some further investigating to find the owner. I live at [address], next door. I am writing in relation to concerns I have about a potential threat to health and safety posed by trees on your property. The tree(s) that I am concerned about is/are [beech/oak/pine etc] located [describe location e.g. to the east side of your garage]. I have marked the trees on the enclosed rough sketch map so that you can clearly identify which tree(s) in particular cause me concern. The owners of trees have a legal duty of care to make sure that their trees do not pose a danger to neighbours or their property. I would therefore be grateful if you could obtain a tree survey and if this shows it is potentially dangerous, to arrange for removal or pruning of the tree. You may have previously been unaware of the condition of the tree(s) and the potential problems caused by this. However now that this has been brought to your attention, I would request that you take action. If you do not do so, the local council potentially could take action themselves to assess and remove any trees. They may however charge any cost of doing so to you, and that is likely to cost more than if you initially carried out the work. I am keen to resolve this amicably; we are after all neighbours! I would therefore be grateful if you could look into this matter and arrange assessment and removal or pruning of the tree(s) as a matter of urgency. To all who post on this website, I wish to inform everyone who posts that the people who are running this website are not who they make out to be. Sometime ago, I left a comment on here with personal details accidently and asked for those running this organisation to take my comments down and instead they made fun of me, when my messages became more desperate (because it was a serious violation of one's rights). I have since tried to report this via one route to Trading Standards but am going to try another route. These people are actually bullies who are probably harvesting your details when you post and so obviously not to be trusted. They are probably of the same group of those who behave like louts with a setup to catch those who feel that they have reason to protect themselves anonymously. The people who run this website has a distorted mindset or so it seems as this way of thinking is misplaced sense of justice. DO NOT TRUST THIS WEBSITE. Last year I had considerable damage to my property when two trees on a vacant and unattended lot next to the back of my property both had huge limbs fall onto my land, new fence and broke down part of a beautiful Ornamental Cherry tree. I had to pay landscapers to clean up all those trees including the section from my Cherry tree, and replace the three sections of my fence. I was told by the landscapers that I had better send the owner of that property a letter informing them of what happened and that. One of the trees was completely dead and needs to be taken down. I went to city hall and found out who the owner of the lot was and using the above template to go by sent a letter to the owner by Certified Mail. As of today the letter was undeliverable ....where do I stand if doesn't get delivered or picked up and is returned to me? If I have more damage from those trees falling or any others as there are many what are my rights? Is there anything else I should do? Mail another letter by regular mail? I live am am owner occupier of a house. The Neighboring house and garden have an adjoining fence and wall. There is a row ofmature Leylandia and Hawthorn running alongside the fence.This is forms part of the neighboring garden. The House is owned by a Trust and occupied by tenants, the Hedge has not been pruned properly for 2 years now and is currently reaching heights of 12 foot in places, grows through trhe adjoining fence over my path and gate.There is also an indication that the roots are lifting my pathway . The main sewer oulet also runs just below this path!I have informed tenants next door and the Housing trust as I have done my best to manage the hedge form my side,but am unable to reduce the height. This appears also to be futile if same hedge is not being managed form the garden in which it is located. There has been no action on this for 6 weeks. I have read some of your articles which give some good advice,however having informed the responsible parties and no actionis it really at my expense ,damaged tools .legal advice and any serious damage to property that I have to put this situation right? We have conifers in our garden that have been there for 20 years plus. We regularly cut them down to avoid blocking light to those at the back. However neighbors at the back have complained that the trees are going into their property and psychotherapy boundary fence down. We have said they able to cut the trees back. However they say they have got really bad and want us to do it. Our question is. Why didn’t they cut them down before they got so bad?We have never tried stopping them from doing so and have always told them to feel free to cut them. Is it our responsibility to get them cut down from their side?Even though we’ve previously said they could do it? Hi my neighbour has two huge conifers one that excludes light to my solar panels and the other light to my hallway/landing and potential risk of damaging my property!There is also ahuge sycomore tree that is overhanging and is also now excluding light to my solar panels, what are my rights? There is a tree that is at the bottom of my garden that is at the side of the neighbours. We have had several talks about going half half to get it cut down but the neighbours have pulled out. The tree has grown to the point were it has uplifted the fence. What can I do? I'm also thinking about a written agreement if it does happen- any tips on how to write it? Who does the tree belong to? Sorry it's not clear. Please my house is nearby is next door to an embassy, the tress at the embassy bring a lot of rubbish to my house. I would to write to them if they can cut down the trees to prevent the flowers from falling to my house. How do I go about the letter. Thank you. The letter template is designed to help with a neighbour's problem tree and we hope that helps. Note however, that a tree owner is no obliged to cut down trees simply because foliage, flowers etc are falling into a neighbouring property. "You cannot force your neighbour to remove overhanging branches or fallen leaves on your property. However if these cause excessive damage, you can sue them for the cost of repair. It is however always better to try to amicably resolve any disputes so contact the tree owner to discuss it. " "If you are concerned that a tree is diseased or damaged and poses a danger due to having fallen, or being at risk of falling, you should contact the owner of the land on which the tree is growing. If the land belongs to the local council, contact them to request that the tree is cut down or pruned. If you are unable to contact the land owner or they refuse to take action, contact your local council's Environmental Health Office. The owner is not under any legal duty to take action, but will be liable if a tree they knew to be damaged caused damage to Property or injury to a person." I have a neighbors conifer hedge that is approx 12 to 14 feet high , is there a limit on height ? The trees do not overhang the boundary. I havea neighborsconifer hedge that is approx 12 to 14 feet high , is there a limiton height ? The trees do not overhang the boundary. What's the law on high leylandi hedges . At the back of my garden there are a row of 8 l eylandii and 13 feet high. The neighbour that owns them lies about when he gets it did and leaves it for 3/4 years before he fits it. He should get it cut anually. It's upsetting when it's so overpowering. Any thing in the law about this . We are private properties so council dont get involved. Last summer my neighbour planted a tree right in front of my kitchen window, about 5 foot from my house wall. I have lived in my house for 23years. A sale of land between previous owners means that house wall with kitchen window in it is only accessible through their garden. I am concerned about the roots being so close to my building foundations and also the fact that the tree is growing big enough now to block out light. My next door neighbour has an oak tree, the canopy of which has now spread beyond the width of their garden and is now encroaching into my air space, which I understand is classified as "trespass". Please advise if this is correct and do I have the right to insist that it be cut back or do I have to be polite and request that the over hanging branches be removed. In conclusion, may I ask if you have a letter template covering this type of complaint. Thanking you in anticipation.Mrs Gibbs. In general a tree owner is not obliged to remove branches that overhang a boundary into a neighbour's garden. As the neighbour, you can cut back anything that overhangs your side of the boundary. You should offer back any branches that you have removed, but the tree owner does not have to accept them. If you think the tree is dangerous or diseased in any way you should inform your neighbour to make them aware of this - they can then take decision about what they want to do with the tree and (being aware of the danger) can be held liable for any damage. This doesn't apply to a health tree (where as mentioned, the tree owner has no obligation to remove any growth into a neighbouring property). My next door neighbour has an oak tree, the canopy of which has now spread beyond the width of their garden and is now encroaching into my air space, which I understand is classified as "trespass". Please advise if this is correct and do I have the right to insist that it be cut back or do I have to be polite and request that the over hanging branches be removed.In conclusion, may I ask if you have a letter template covering this type of complaint. Thanking you in anticipation. Mrs Gibbs. The house behind ours has a tree that has grown to around 30 feet. They have previously refused to do anything about it due to the amount it will cost. The branches are now over hanging a good 10 feet into our garden (there is a foot path between us and them). As well as the loss of daylight, my main concern is that we have a pipe running through our garden and that the roots will hit this in the not too distant future. What rights do we have? Thanks. I have a silver birch growing in my garden that my neighbour has asked me to prune. The extent of pruning he asked for, is to take out the top as it is depriving him of light. The tree provided privacy to my garden and the upstairs windows. 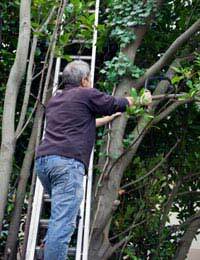 He has without my permission previously cut branches over hanging his property, which I accept he is entitled to do, although he never consulted with me. There are some branches that have been cut back closer to the trunk beyond the extent of the boundary line. I have consulted a tree surgeon / arborist who has confirmed the tree is not dangerous, there is no evidence of shallow roots and that the degree of pruning to clear any further overhanging branches could not be achieved without leaning a ladder against the tree or my fence. He gave me a quote for the work. I have told my neighbour that I'm not prepared to pay (for fear of setting a precedent), that it affords me privacy, that it is not dangerous or restricting daylight. I have said he can pay but I'm not granting general consent for him to prune what he wants without talking to me further. Is there anything more I should do to avoid him ignoring my request and pruning the tree anyway? Your neighbour can only cut back anything that overhangs his side of the boundary (he doesn't have to ask your permission to do this). He cannot force you to prune the tree simply because it's cutting some light from his garden and clearly the tree is not causing any damage to his property. If he were to try and remove any further branches from your tree this would be criminal damage and possibly trespass depending on whether he needs to lean over the boundary. It might be worth having a polite conversation with him to let him know that he cannot cut any more from the tree etc. Concerned the offending tree belonging to the housing association has already caused damage to my boundary wall the roots have undermined it and are now protruding up in my garden. They are refusing to repair the damage caused. What can I do in this instance. You can cut back any roots that intrude into your garden and can cut back any branches that are growing over the boundary line which might prevent further damage. If you want reimbursement for the cost of repairing damage already done, you might need to consider legal action or your home insurer. In general, a tree owner is only liable for damages if he/she is aware of the potential danger before it occurs.